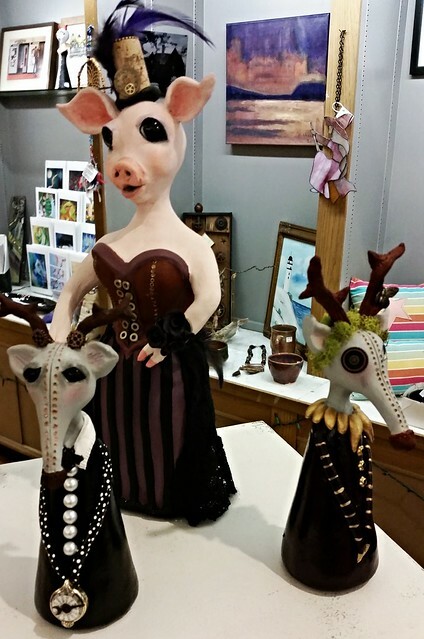 Three strange dolls on display at Salem Arts Association. Now this is quite the interesting family! I met them at the Salem Arts Association in Salem, Massachusetts. Like I said yesterday, there is such an odd and curious assortment of art that is free for the perusing. Their strange animal heads with human bodies and curious apparel made me want to stare at them for a long time, just like they essentially are doing with their black lifeless eyes. Of course, I can imagine having one of these in my house and at some point, coming into the room where it is displayed and being slightly freaked out if I was caught off guard by them.